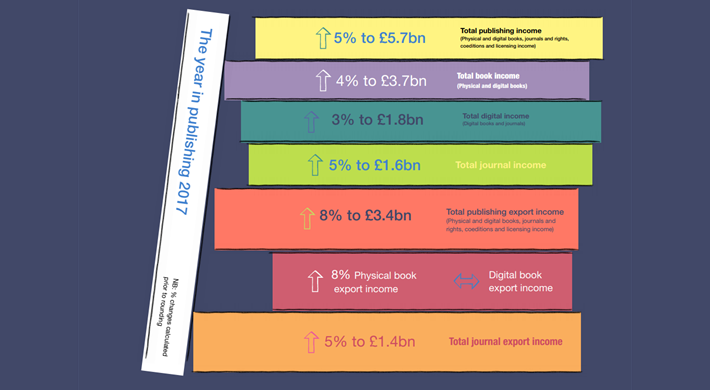 The Publishers Association released 2017 statistics on the UK book market, emphasizing strong export sales and the book industry’s economic contribution ahead of Brexit. 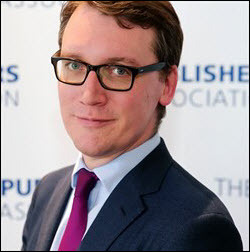 Pushing its position in book exports ahead of the March Brexit deadline, the UK’s Publishers Association’s annual “Yearbook” report for 2017—released today (July 19)—is touting an 8-percent rise in exports in that year to £3.4 billion (US$4.4 billion). 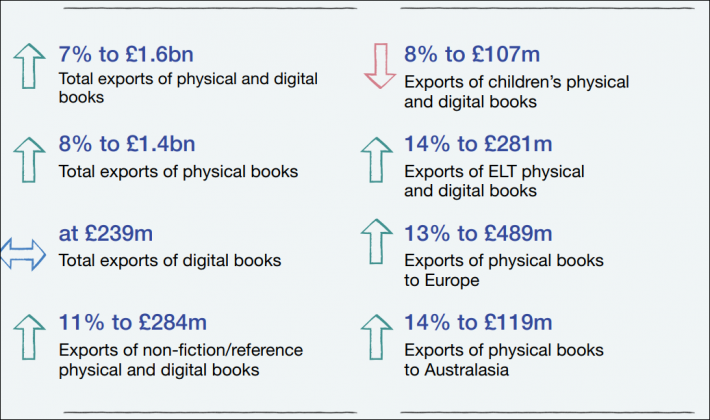 Exports, according to the report, accounted in 2017 for 60 percent of the British book industry’s revenues. Europe accounted for 36 percent of 2017’s exports’ value. The report is now available free to association members and on sale to non-members in the association’s online store. CEO Stephen Lotinga in his introduction calls UK publishing “a powerhouse of the creative industries.” Lotinga and others in the UK book business are working to establish the publishing industry’s standing as the country prepares to leave the European Union. It’s an important moment for traction. As Publishing Perspectives has reported, a recent example arrived a week ago in the association’s report on how much of film, television, and theater production is based in the storytelling content of books. Similar reports have looked at the industry’s economic and educational contributions. In the run-up to Brexit, this kind of hard data about the book industry’s contributions to the UK’s creative industries may well count more than any one year’s upbeat revenue figures. But, happily, that’s not to say that the news from 2017 is bad. Overall, the association in its 83-page Yearbook report is citing a 5-percent rise in value indicators, translating to £5.7 billion (US$7.4 billion) for 2017, a record. As Lisa Campbell at the UK’s publishing trade magazine of record, The Bookseller, is pointing out, it can’t be overlooked that “While most areas of business performed robustly, domestic sales of textbooks to schools took a 12-percent hit, revealing that savage public sector cuts are starting to bite in the education” sector. That may cheer observers concerned that sales of consumer ebooks in the home market—again, meaning in-country as opposed to in exports—are reported to have come in 9 percent lower in 2017, bringing their figure down to £139 million (US$181 million). Perhaps never as comfortable as the Stateside market with ebooks—which is hardly to say that everyone in the US industry likes them, either—the UK industry on the whole has remained predominantly fond of print, and many will be pleased to know that print saw its revenue rise in the UK in 2017 by 5 percent. As has become expected now, audiobooks again (as in the States) have shown up in the association’s 2017 report as the brightest spot, their progress this time coming in at 25 percent for a figure of £31 million (US$40 million). Audiobooks’ newfound success, it should be pointed out, is thanks to the frequently derided digital element of modern publishing: it’s the ability to download them that has made the format popular again, freed at last from the awkward physical media of CDs and cassette tapes. In his prepared statement for the press on the release of the Yearbook to media members, Lotinga is quoted, saying, “These figures reveal another stellar performance from the UK publishing industry. From blockbuster novels to the textbooks and research papers which shape our thinking, today’s statistics prove that society’s love of books in all forms shows no sign of waning. One potentially worrisome sector may surprise some: children’s book sales, with print and digital taken together, are reported to have been down in 2017 to £341 million (US$443 million.) Lotinga, in his introduction, anticipates concern here, writing, “We shouldn’t read too much into the dip in children’s publishing, which could be largely explained by the absence of a Harry Potter book in 2017. There is still a story of significant growth in this sector over the last five years.” And, indeed, at many points in the report, the five-year perspective is brought to bear on the 2017 figures. Some high points of this focus follow. “There has been an increase in exports of both physical and digital books, up 7 percent to £1.6 billion (US$2 billion). “Export sales income from journals has increased by 5 percent to £1.4 billion (US$1.8 billion). “Rights, coeditions and licensing export income is £407 million (US$529 million). 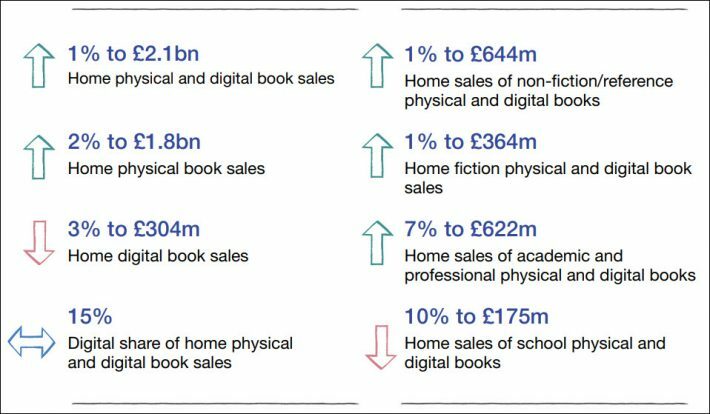 “There has been an 11-percent increase (to £284 million, US$369 million) in the export sales income of nonfiction/reference physical and digital books. “Sales of physical books to Europe increased 13 percent to £489 million (US$636 million), and to East and South Asia by 8 percent to £248m (US$322 million). “Digital school book sales export income has risen by 93 percent to £10 million (US$13 million). “Non-fiction total digital book sales have increased by 4 percent, suggesting consumers are increasingly reading nonfiction, cookbooks, illustrated books and reference books on their devices. “Overall digital school book sales performed better than physical, with domestic sales income up 12 percent and export sales income up 93 percent. 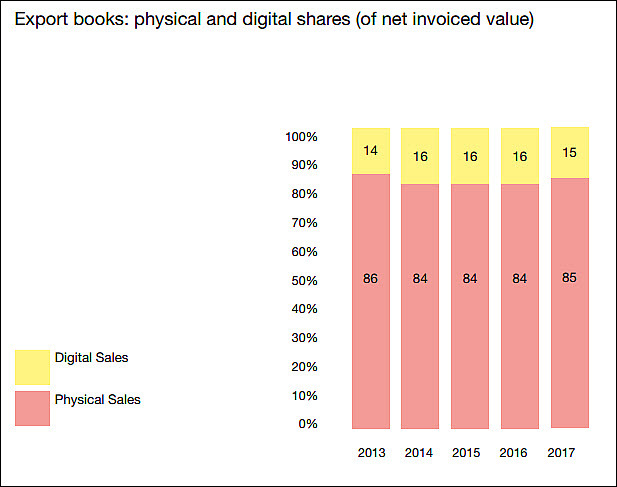 “Fiction sales income (physical and digital) is up 3 percent. “Nonfiction/reference sales income (physical and digital) is up 4 percent. “Home non-fiction/reference physical book sales income is up 2 percent. More from Publishing Perspectives on the Publishers Association is here.